My aim in these lectures is to examine the multifaceted and mutually perpetuating connections between dynamical systems, combinatorics, and number theory. In particular, we will discuss Furstenberg's ergodic approach to Szemerédi's theorem on arithmetic progressions and its far reaching recent ramifications (including polynomial extensions of Szemerédi's theorem and the Green-Tao theorem on arithmetic progressions within the primes), applications of ultrafilters in modern research, and the role of flows on nilmanifolds in ergodic Ramsey theory. Following Wednesday's lecture there will be a reception in honor of Professor Bergelson at the Koenig Alumni Center, 1202 University Avenue (the SE corner of Broadway and University). 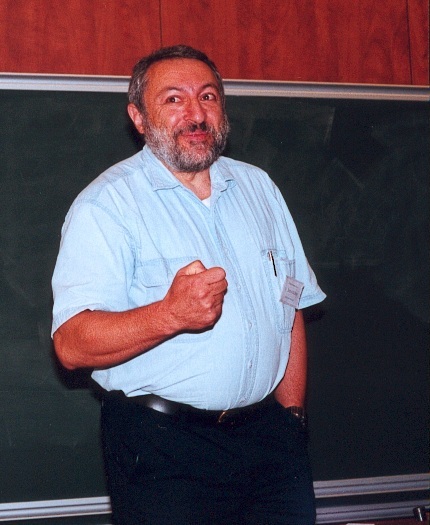 Vitaly Bergelson received his Ph.D. from the Hebrew University of Jerusalem under the guidance of Professor H. Furstenberg in 1984, and was awarded the Landau Prize for his doctoral dissertation, which dealt with applications of ergodic theory to combinatorics. After graduation he accepted a postdoctoral position at Ohio State University and has been with OSU ever since. He is engaged in extensive research and advising work which is mainly devoted to the interplay between dynamics, combinatorics, and number theory. Professor Bergelson is actively devoted to the dissemination of mathematical knowledge; he has given hundreds of lectures all over the world, including an invited address at the International Congress of Mathematicians in 2006 in Madrid, two plenary talks at American Mathematical Society meetings, a Mordell lecture at Cambridge, mini-courses in Italy, India, Mexico, Chile, the Czech Republic, South Korea, New Zealand, and series of lectures at the CBMS Conference on Ergodic Ramsey Theory at Eastern Illinois University and at the School on Dynamical Systems in Trieste. This Lecture Series is funded by an endowment given by Professor Ira M. DeLong, who came to the University of Colorado in 1888 at the age of 33. Professor DeLong essentially became the mathematics department by teaching not only the college subjects but also the preparatory mathematics courses. Professor DeLong was a prominent citizen of the community of Boulder as well as president of the Mercantile Bank and Trust Company, organizer of the Colorado Education Association, and president of the charter convention that gave Boulder the city manager form of government in 1917. After his death in 1942 it was decided that the bequest he made to the mathematics department would accumulate interest until income became available to fund DeLong prizes for undergraduates and DeLong Lectureships to bring outstanding mathematicians to campus each year. The first DeLong Lectures were delivered in the 1962-63 academic year. If you have any questions concerning this lecture series, please contact Mathematics.